The 4-year-old from Kingman was diagnosed with Stage 4 high-risk neuroblastoma in February 2016, according to her mother. Having a child is the most beautiful and scariest thing. Honestly. You want to protect your child from all harm and believe that nothing could ever happen to them, including illnesses. But, that's not the case all the time. What you can do is always look forward and know that your child can get better for their future. I have been following Natalie Dawn's Facebook page for the last week and it just completely tugged at my heart, her strength and courage. 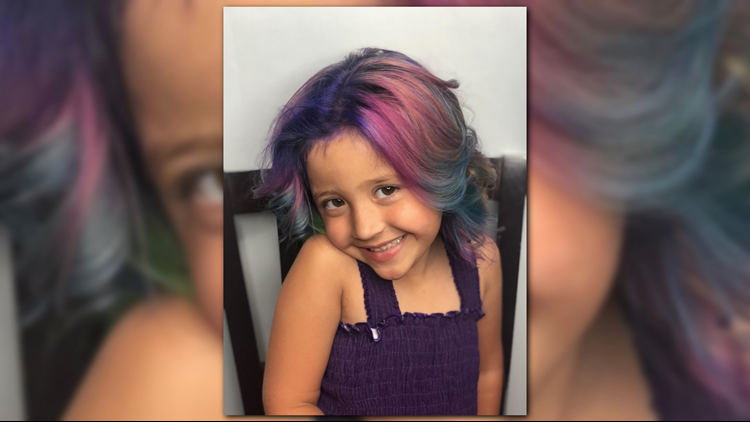 "She went through five rounds of chemo and various treatments at Phoenix Children’s [Hospital]," said her mother in an email. Her mother says that Natalie had been no evidence of the disease for a year in a half. Sadly, Natalie needed emergency scans and the family received the devastating news that she had relapsed. "This was so devastating to our family as well as Natalie and not only does our sweet girl get so much of being a kid taken from her again," said her mother. "She has to fight this awful disease once again." The sweet, feisty little girl wasn't too happy to hear her cancer was back. Her mother says Natalie was heartbroken to know she would be losing all her hair again. The family decided to let her do whatever she wanted with her hair. "She decided to have it done rainbow," said her mother. Her mother says a local salon did this for Natalie and actually made an entire day dedicated to her and this moment. The family wants to hopefully send a message to the community that adults and children that are going through what Natalie is, need to be more sensitive. "Please teach your children not to stare and make [notice] and that not everyone gets to do all [child like] things because these sweet kids are in a hospital fighting for their lives," said Natalie's mom. Natalie's mom says that the family will be traveling back and forth from New York, where Natalie is currently receiving treatment, to Arizona for a couple of years. "Something that we would tell a family that was diagnosed is that even though it seems like the worse thing ever -- look towards the future," said Natalie's mom. If you like to help the Dawn family, please click here.